With many years of experience in the industrial SSD sector, Apacer has been a customized product manufacturer trusted by industrial computer and server corporations in the U.S. and Japan for a long time. To provide customers with a more diverse product range, Apacer has revealed three models of the new-generation of modular SATA SSDs; the SDM4 MP (SATA Disk Module, Middle Profile), with 7-pin SATA connectors available in three orientations of 90°, 180° and 270°, along with a patented built-in power supply design. These are designed to meet user-specific needs for various form factors and industrial designs. Compared to that of its predecessor, the reading speed of these next-generation SSDs has been boosted to 85MB/sec. Not only SLC solutions but MLC solutions can also support operating at industry-level extended-temperatures (-40°C ~ 85°C), and are especially suitable for stable operation under rigorous industrial environments. 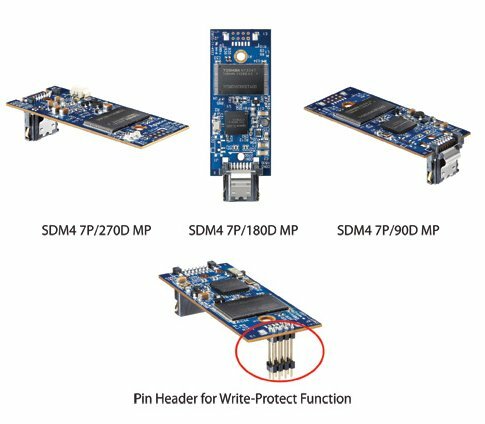 To protect data against vicious tampering and boost data storage security, the SDM4 MP industrial SSD series can enable Write Protect function upon customer request. The write protect function can be implemented by a hardware switch on the top of PCB, or by a customized pin header on the bottom, allowing customers to switch on or off this Write Protect function directly without system rebooting. Additionally, the design of the pin header at the bottom enables the product to be more closely connected with the motherboard for effective shock resistance. At present, this product has attracted overseas POS applications, and Apacer is expected to provide storage solutions with outstanding performance. Apacer’s latest SATA Disk Module 4 series are available in capacities from 2GB to 32GB for SLC solutions and 4GB to 64GB for MLC solutions. The SDM4 MP series feature ECC (Error Correcting Code) function, S.M.A.R.T (Self-Monitoring, Analysis, and Reporting Technology) and ATA Secure Erase command - all of which help boost the product's reliability and stability. These features, along with the support of the Windows 7 Trim command for optimization, have made Apacer SSDs one of the prime choices among professional storage solutions.